Pong is probably the first game I remember playing, how much enjoyment and wonder a got watching a square ball bounce from side to side. You can now make your own pong game and there’s no need for any coding as this is a hardware solution. The Classic Video Table Tennis Kit (or pong to us) is a PCB kit that you make your self. You’ll need a soldering iron, patience and geek tendencies. This is so much more useful than the Love Heart Kit we reported on before Valentines day. What would you rather do with a bag of resistors, diodes, and capacitors; build a flashing heart or a cool pong game!!! 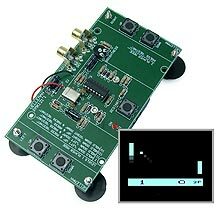 You can get the pong kit for $19.99 from Think Geek.